I had big plans to post a really awesome, kick-off-the-brand-new-year-with-brand-new-healthy-recipes healthy recipe. Then…life kind of happened. I paid off my car. Then I proceeded to total said car the next day. (I posted about this on Instagram and had so many loving and concerned comments and I couldn’t respond to each of them, but THANK YOU so much! I’m fine–my injuries are minor (thank you, Honda! ), and while they weren’t minor to my car, I get to pick up a new car today, so I have a lot to be thankful for. Lesson learned: when you want to turn left and someone stops to wave you through and you can’t see the outside lane, don’t go, even if the guy waving you through is holding up an entire block of traffic and rolls down his window to assure you the other lane is clear. It wasn’t.) Anyway, in addition to dealing with all that business, we had a “surprise” science fair project, a birthday, and a stomach bug to round it all out. So…you know…basically life. 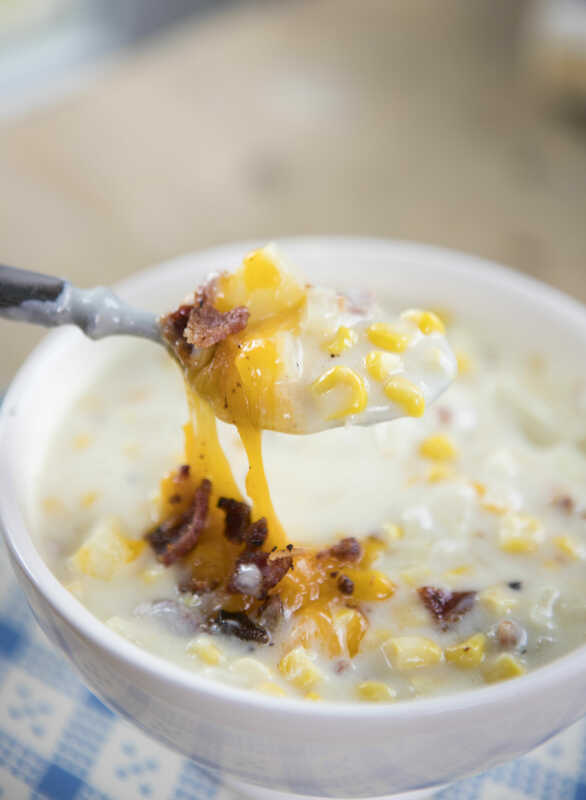 This recipe for Creamy Corn Chowder is one of my all-time favorite recipes, and it just so happens that it’s also healthy and really fantastic comfort food. If you’ve never made it, do it. This week. I’m being bossy. This recipe is near and dear to my heart because it’s the first recipe I ever made up from scratch. I started making it when my husband and I had just gotten married in 2001 and we were beyond-broke college students. It had everything we could afford–canned corn, milk, potatoes, onions, chicken bouillon and was quick, easy, nutritious, and filling. It has become one of my ultimate comfort foods–even this afternoon, as it was bubbling on the stove, I took a sniff and was taken straight back to a simpler time in my life! The bacon is optional, making it potentially vegetarian. If you decide to leave the bacon out, I’d recommend adding about 1 tsp. of smoked paprika to get that yummy, smokey flavor in the soup. While the bacon is cooking, melt 2 tablespoons of butter over low heat in a soup pot. 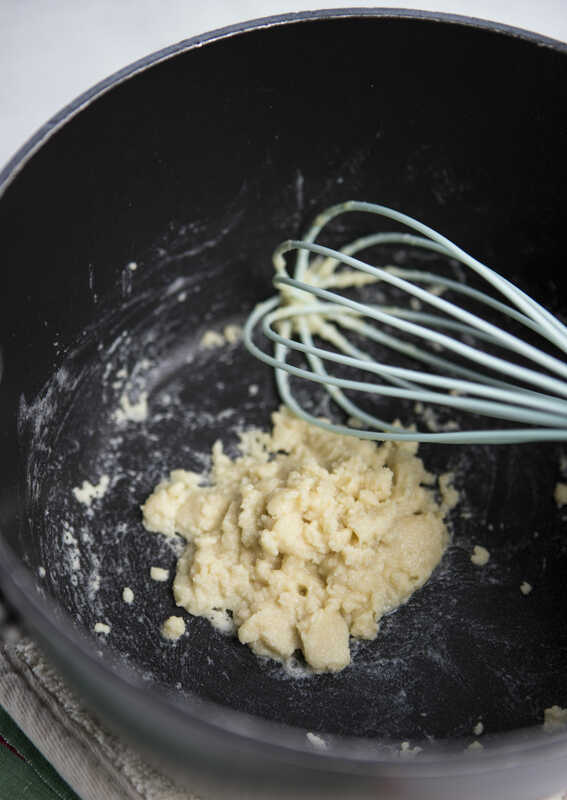 When melted, add flour to make a roux and whisk until it comes together in a little ball. Add water and whisk until completely combined and there are no lumps. Add milk and chicken base or bouillon and bring to a simmer. Add potatoes, onions, and garlic, and simmer (but don’t boil! ), stirring very frequently, for about 20 minutes or until potatoes are tender. Add crumbled bacon and corn and heat through. Add a few drops of hot sauce and then salt to taste. 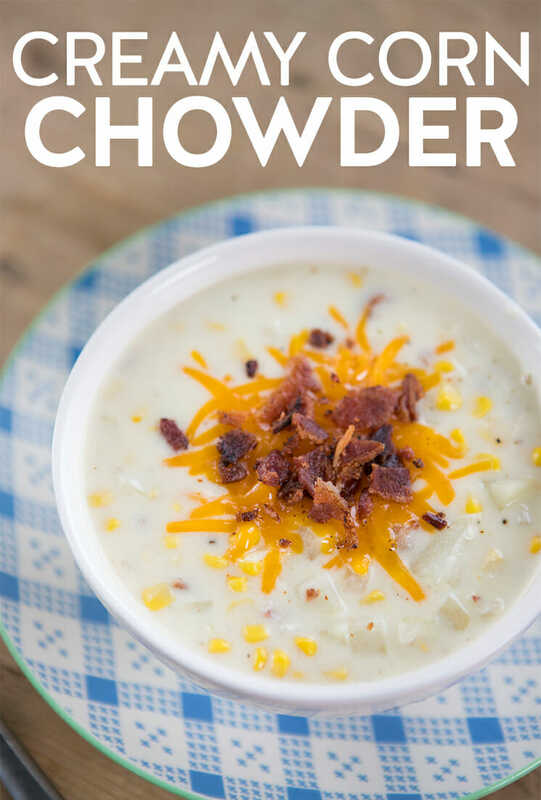 The reason why I don’t have an exact measurement is that while the soup REALLY needs salt, bacon also really differs in its saltiness, so it can be super easy to make this soup way too salty. Start with about 1/4 teaspoon, give it a few minutes, and then add more if you need it. Ladle into bowls and sprinkle with extra bacon and/or cheese if you want. 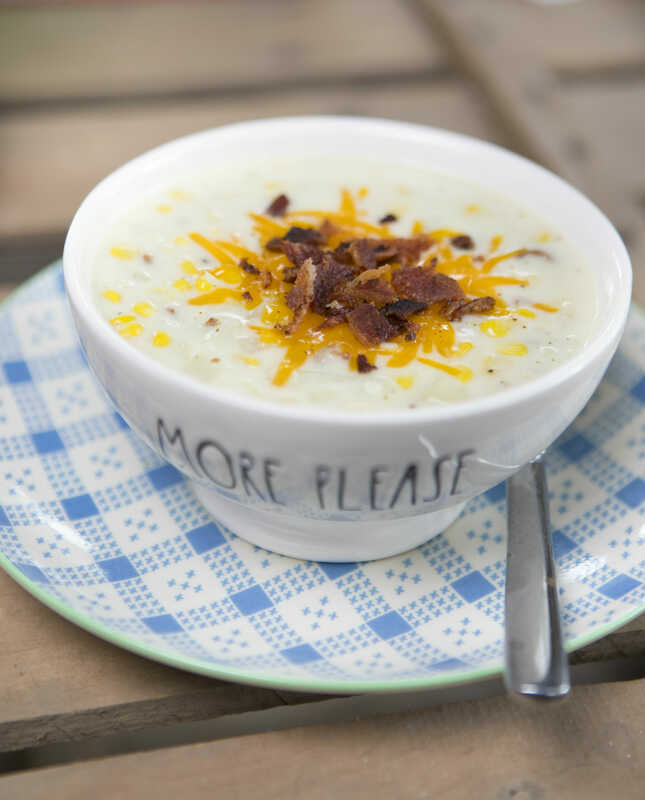 Because, you know, if there’s anything a perfectly healthy bowl of soup needs, it’s bacon and cheese. I’m dead serious. 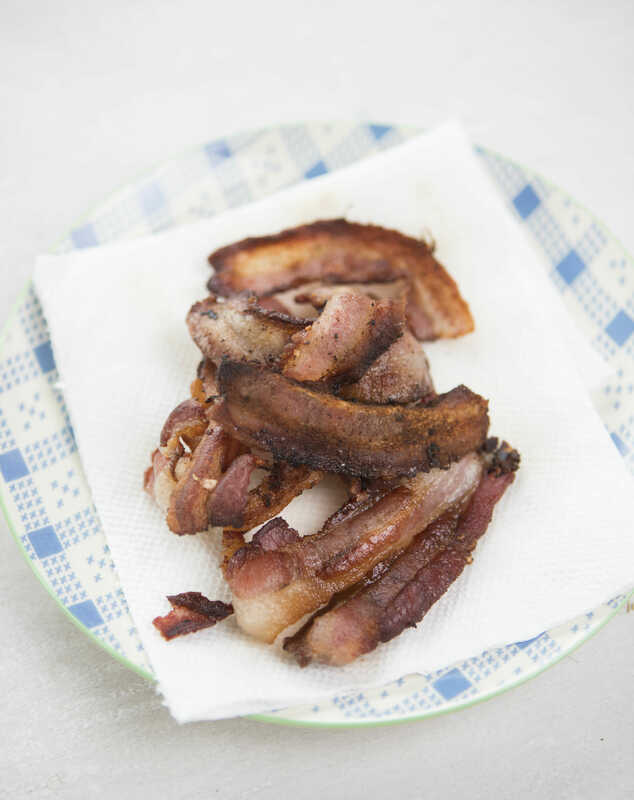 Fry bacon until crisp or make it in the oven using this method. In the meantime, melt butter over low heat in a soup pot. 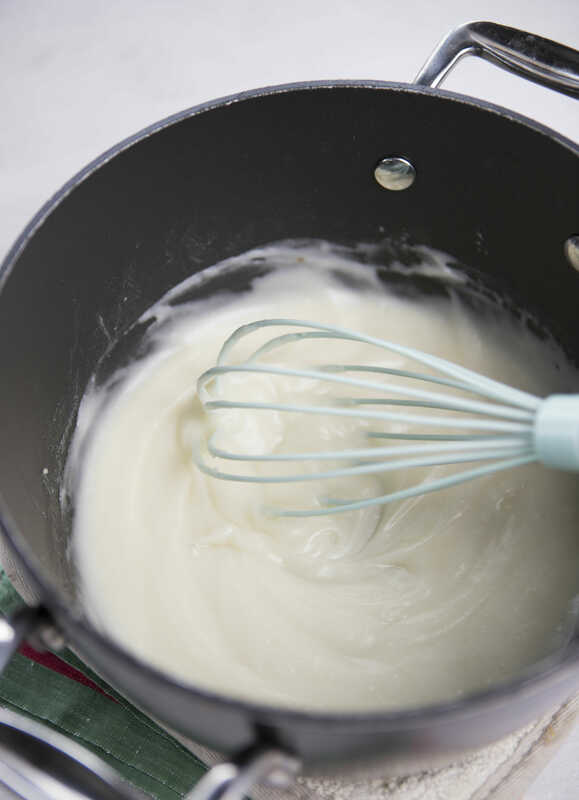 When melted, add flour to make a roux and whisk until it comes together in a little ball. Add water and whisk until completely combined and there are no lumps. Add milk and chicken base or bouillon and bring to a simmer. Add potatoes, onions, and garlic, and simmer (but don’t boil! ), stirring very frequently, for about 20 minutes or until potatoes are tender. Add crumbled bacon and corn and heat through. Add a few drops of hot sauce and then salt to taste. The reason why I don’t have an exact measurement is that while the soup really needs salt, bacon also really differs in its saltiness, so it can be super easy to make this soup way too salty. Start with about 1/4 teaspoon, give it a few minutes, and then add more if you need it. Ladle into bowls and sprinkle with extra bacon and/or cheese if you want. Enjoy! This looks so good, I’m going to make it next week. I’m so ready for Fall also! I am going to have to make that soon. I’ve got taco soup in my crockpot right now, but now I’m kind of wishing I had seen this recipe first. Yum! I can’t wait to try it. Creamy Corn Chowder I’ve been dreaming of you for years. . . ever since someone brought me a pot with cheese and bacon after I had my second child. This looks just like that!!! Mmmmmmmmm. . .
Hey Kate – you made my day. It is chilly up here in the North East and soup sounds good to me. Well, particularly because my oven is broken :^( Stove top and grilling are my friends right now! 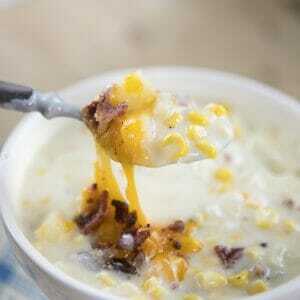 That corn chowder looks incredible! I’m bookmarking this so I can make it soon! Thanks for your comment on my Oreo Turkeys. They would be perfect for the cub scouts to make! that soup was num-o. My husband’s recommendation for next time – double the recipe so we can have leftovers. Thanks! I was going through your blog to find something last minute for dinner and I ran across this recipe and had all of the ingredients, so I went for it!! WE LOVED IT! This will definitely be one of our new family favorites. Thank you. My husband and his friend had been working outside all day in 95 degree weather, so I was worried that they wouldn't feel like soup, but they LOVED it! Thanks! Hi there – this looks delish! Question – is this 'crockpot-able'? I would love to prep it the night before and let it happily simmer away while I'm working – what do you think? I don't think I'd put this in the crockpot. I haven't had great luck with using large quantities of milk in the crockpot because it tends to curdle. I'm sorry I don't have better news! OMG! I just had Corn Chowder soup the other day for the first time. I loved it! So as adventurous as I am, I decided to try to make my own, a friend of mine referred me to your site. I am making the soup right now and I am excited to try it! Yum! I am eating this for lunch right now. We never have canned corn, but tons of frozen corn that we put up in the summer. I just added it with the potatoes to let it cook. So good! The seasoning/spices are just perfect in this one. I know you said this is only 3 weight watchers points, but how many calories does that translate to? McKay–I usually ends up being about 50 calories per poing, to it's probably about 150 calories. Best chowder I've ever had let alone made! Love the kick from the tabasco sauce! I made this along with the Creamy Tomato soup, and a squash soup (not the one on this site), and had a taste test with friends. They said this Corn Chowder soup could have rated #1 if it didn't have so many onions. Maybe try half an onion if you make this? Do you think it would taste okay if I substitute baked ham for the bacon? Meridee- I actually put ham in this all the time. I usually have ham around for my kiddos to eat so I just chop it up and add it to the soup and then use the bacon for the top. Works great! I am in love! Its the first day of winter down here in New Zealand and its has rained all day! This chowder sure hit the spot for comfort food on a winters day. 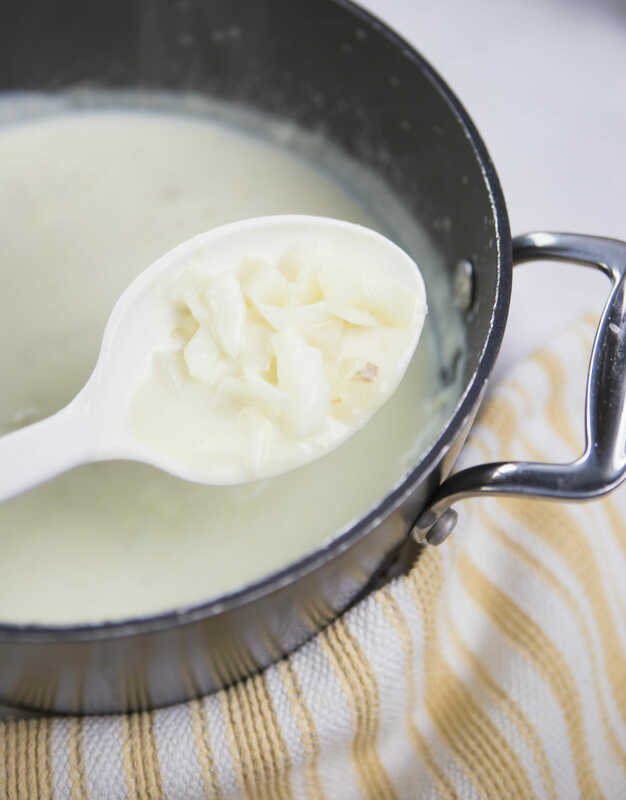 Who knew you could make something so creamy with just 2 Tablespoons of butter? Thanks for sharing. Just stumbled across this one (love your site BTW) and am going to give it a go! Question for you….do you know if this freezes well? Thanks for your awesome site! Hi, Becky! You know, I've tried freezing this and it just ends up curdling every time. It still tastes great, it just doesn't look super appetizing, you know? Yummmmmmmy! It has been voted to be back on the menu. I didn't have bacon and forgot to put ham in but was still delicious. I was wary of the amount of onion, but I used a very small onion and it softened up a lot. Just learned about your site through some friends of mine here in Amman; tried this chowdah recipe tonight (although my intro to your site was the "best dinner rolls," which they served to me). Delicious! Essential "fall" comfort food for us here in the Middle East. Keep these great recipes coming! I'll be trying others. Just found your site last week and I've already tried 2 recipes… amazing! My new favourite blog :). As for the corn chowder, is it freezable?? CurlyJ–Welcome!! I'm so glad you've loved what you've tried so far. 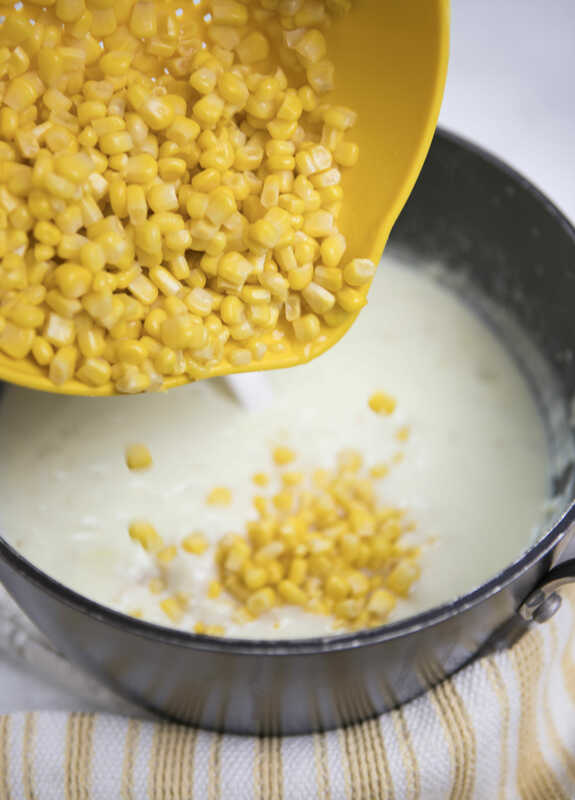 As for freezing the corn chowder, I wouldn't–it would still taste good, but it would be a curdled mess. Yummmm! I have this cooking on my stove as I type. Just keeping it warm until hubby gets home from work. It was so easy to throw together and used up some corn I had frozen from summer. Smells delicious in here! This soup sounds yummy, and we're having it tonight. But I was wondering, couldn't you use the leftover bacon fat instead of the butter for the roux? I don't care for bacon and don't have smoked paprika. I do have liquid smoke. could I use it? If so, how much? Thanks! This will be perfect for Christmas Eve! Thank you for posting! Dustbunnies- yes, bacon fat would be great for a roux! This turned out delicious! I didn't have skim milk on hand so I used 2%. It ended up being a little thicker than I like so I added about a cup of stock. It was perfect! I just found your website last week. The corn chowder was the first recipe I've tried and I love it! I can't wait to try more of your recipes. Thanks for another wonderful recipe. i love your site! We had this last night and it was such a thick, comfy food to eat. I'm pretty much going to make this in doubles from here on out. I wonder if this freezes well with the potatoes in it? This was my first time making a roux for soup. I was so shocked it worked! It's so creamy and I only used 1% milk. Try it you'll like it. How many servings does this make? Have you ever made it with evaporated milk? That's what I have on hand so I'm going to use it just wondering if I need to make any other changes because of it. Thanks! Angie–It makes about 6-8 servings. I've never tried it with evaporated milk and honestly, I probably wouldn't if I could avoid it just because it has such a distinct taste. But if you really need to, I'd probably reconstitute it with water first. Just made it and ate it for dinner. 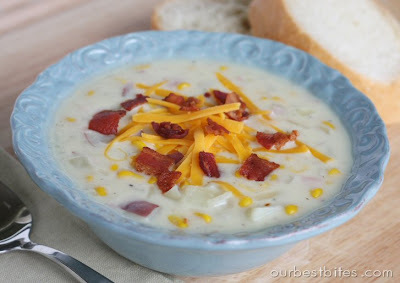 Very simple taste, which is VERY refreshing for a corn chowder; like you said too many people make them sweet or add lots of extras that turns it into something other than a corn chowder. This worked for me! Never made soup from scratch. My house smells so good, all I need it the potatoes to get soft and then I can eat it! I plan to use the base to make clam chowder sometime in the next few weeks. We made this tonight – not for the first time – and added 3 small cans of clams and a few dashes of Old Bay. It made a very nice, mild clam chowder. I love the versatility of this recipe! Great soup- the whole fam enjoyed! I used center-cut bacon which made it even better. My fam (3 kids, ages 9-5, and 2 adults) polished off the whole pot for dinner with some small rolls on the side. I’ll make this again! I was thinking of adding smoked paprika too, but didn’t, and didn’t even realize you had mentioned that in the post! Yep! Another fabulous recipe. I love this on a rainy day. So yummy for leftovers too. May I suggest adding one ingredient? It come from a GREAT cook, add a squirt of mustard when in pan cooking, it makes the soup creamy w/out the added fat of cream. She doesn’t know why it works, but it does! I do it whenever I make her (like yours) healthy cream of potato soup, you will not taste a difference. Plain old yellow mustard? or one of the fancier ones? This is a go to soup for us. I even take it when I am asked to bring a meal for someone. So yummy and filling. Great whenever. I never leave comments, but I HAVE to leave a comment to RAVE about this AWESOME recipe!!! This is the second time I’ve made it this week. My hubby always compliments what I make, but usually adds, “It would be even better with…” or something to that effect. Well, not this time! He LOVES this chowder. I suggested doubling the recipe next time and he told me to quadruple it 🙂 Your blog (and cookbook) have truly changed my life. I’ve always enjoyed cooking, but now I love it and I was even inspired to update my kitchen. I bought all new dishes, and my first Kitchen Aide mixer! Thank you ladies – you rock!!!! Has anyone tried this with a bit of chicken, to make it a bit heartier? Maybe half of a rotisserie chicken is what I was thinking…let me know your thoughts please. Love the recipes! Hey, can you guys add a “print option” to your recipes? I know some of them have already have them, but this one does not. Question for you…I’m about to make this today for dinner. Should the onions go in raw? Or should I saute them first? i read this isn’t quite crockpot-able, but do you think it would last ok for a few hours in one for a party? we host an outdoor halloween party (in alaska!! crazy us 😉 and I want to make sure it stays warm. we’ve done chili for a couple years now, thought i’d change it up 🙂 and of course i checked your blog first for a recipe! Yeah, you could definitely keep it warm in the crock. Just keep the temp on low! Oh I am so trying this tomorrow night. Daughter and grandson coming over for supper while her husband is out of town on business and it’s getting cold here in North Carolina. Holy rusted metal, Batman!!!! This chowder is gooooood!!!!!!!!!!! MmmMmmmm… I am typing as I eat. This soup is so delicious. I traded the bacon for chicken and added more than a few drops of hot sauce but it is delicious. My husband works nights now so I’ve been making soups for dinner so he can take them the next day and warm them up. This is definitely going to be a hit for him tomorrow. I did read from some people that said the onion was a little strong. I just used a small onion and it tastes fine. Can’t wait to add this to our soup collection – hoping to try it next week! 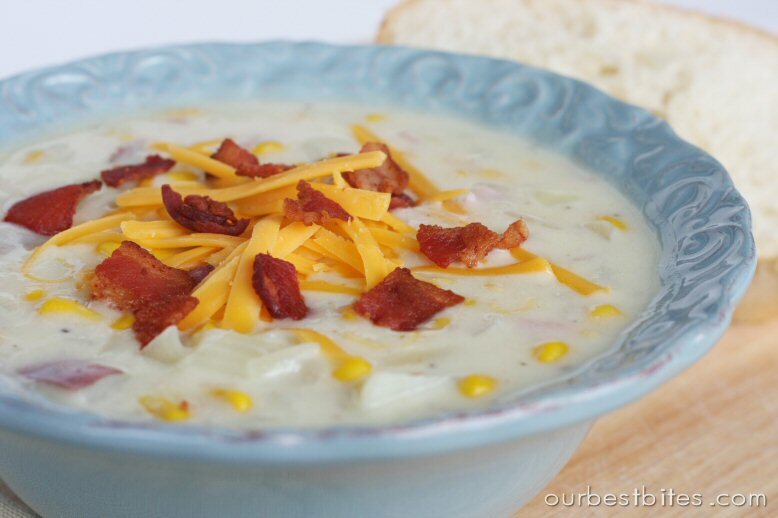 Being from Louisiana….we love to add some peeled shrimp to this for about 30 minutes at the end of the cooking….Corn and Shrimp Chowder….soo good!!! I made this recipe yesterday night.. Here in cold cold Québec city (up north in Canada), there was a snow storm. So this was the perfect comfort food to curl up to. It was definately deliiish! Thanks for the recipe! This was so delicious! It was even better the next day, so next time I might make it ahead of time. I also think I will double it! YUMMY! Thank you so much! Thanks for the recipe! I just made soup for the first time and used your recipe as my base. I used fresh corn and I left out the cheese and bacon – instead flavored with some cumin and ground ancho and chipotle pepper. It gave it a nice smokey zing and is going great with our mussels and chorizo dinner tonight! Thanks again! The entire family loved it. Just made this for supper , quick and easy! and its the BOMB!!! I made this tonight and it was good but I had a problem getting the roux to make a ball? I must have cooked the butter and flour for like 15 minutes. (you can tell I am sooo new to cooking!!) Not sure what went wrong. Any ideas? The soup also was kind of brown for me (perhaps because I cooked the flour/butter too long). Hopefully your help will make this soup better for next time. I browned my onions a bit first (I like them that way) and added a good bit more hot sauce (I think we have burned off our taste buds so we require more and more!). I highly recommend it with the bacon and cheese as the recipe suggests. Hi, I was just wondering if the Weight Watchers points value is with or without the bacon? I’ve probably made this recipe a dozen times in the last year. SO GOOD! This is my first time making corn chowder and it’s delish!! Thanks! You girls never let me down. Simple to make and delicious. Another great dinner…Thank you! I made this last night and it was a huge hit for my family. There was barely enough for my husband and I with our 4 kids 7 and under. Definitely being added to my rotating meals list – although I think I’ll have to double the recipe next time. I’ve made this soup twice now and it is delish! I doubled the recipe and our family of 4 ate it for 2 days, lunch and dinner. I think I’ll do the single recipe as written next time! It’s warm and hearty without being too rich. Thanks!! I made this soup tonight and it was delicious! I substituted almond flour for the all purpose flour to make it gluten free. My husband and kids even loved it, which never happens! Thanks for the recipe! I fed the missionaries tonight and made this corn chowder. The Elders loved it and so did my family. This is my favorite meal! When my husband and I were sick my mom offered to bring us dinner and I requested this because its the perfect feel good dinner! I made it tonight and added some thyme, clams, and used clam juice in place of water and billion. In my oh so humble opinion, its probably the best clam chowder I’ve ever made. I made this for a ward party where it was obvious that way too many people had signed up to bring soup–I bet there were 25 crock pots! Mine was the only pot that was completely empty at the end. Thanks for the great recipe–I am officially a soup rockstar! This chowder is AMAZING! My boyfriend is a picky eater and he always ask me to make it. It’s a must try! Made this soup for the first time last week and my family LOVED it! Making it again today for a church potluck. Love that your recipes are dependably yummy and easy to make. This soup is so perfect for a cold winter day. Corn chowder is one of my favorite winter comfort foods!